Our hats go off to Boots Hughston (2b1 Multimedia) and the Council of Light for doing a magnificent job in creating West Fest, the Woodstock 40th Anniversary celebration. 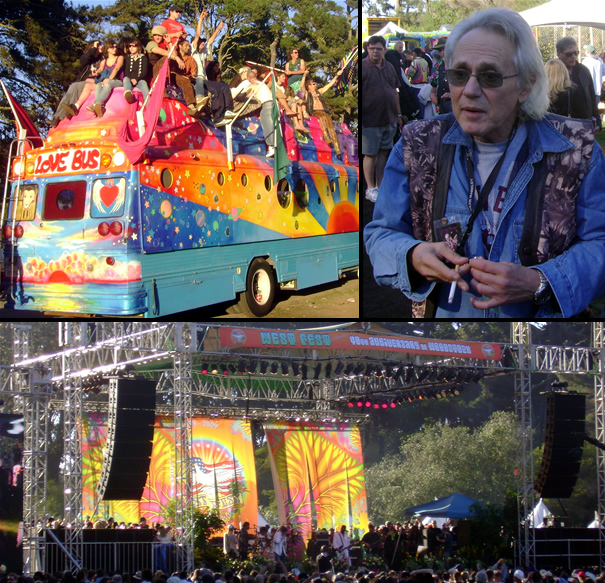 The free event, which was produced in association with Woodstock co-creator Artie Kornfeld, was held in San Francisco on October 25th and drew a crowd which was estimated at over 70,000 people. Thanks to everyone who helped make it happen! West Fest was a great time and had good vibes all throughout the beautiful day. It was truly an event which captured the spirit of the original Woodstock. The music was excellent and diverse with many original Woodstock acts taking stage. In total, 42 bands played on 3 stages in front of a supremely peaceful crowd. There were a handful of naked people walking around the festival, and one could smell the sweet aroma of ganja and incense nearly everywhere you went. The event lasted nine hours at Speedway Meadows inside San Francisco’s beautiful Golden Gate Park, and was more than just a free concert. West Fest was a cultural display. Besides hosting enormous musical talent, it showcased a variety of gifted artists such as clothing and jewelry designers, illustrators, and dancers. Vendors offered everything from smokeware to the truth about 911. When I sat down to take a breather from all the excitement, I was approached by a psychic reader who was remarkably accurate when she told me that I would achieve great happiness before sunset (that is for another story ;0). The substantial crowd at west fest was a great mix of people. From young to old and from yuppies to hippies, everyone seemed to be enjoying themselves immensely. Younger crowd surfers offered baked goods which guaranteed an uplifted mood while some of the older bohemians fell asleep amidst the peace and tranquility. From many of the conversations I overheard, the talk was alive with contrasts of now and 1969, an occasional conspiracy theory, social issues and public affairs. It was positively a great day and a beautiful event to be a part of.